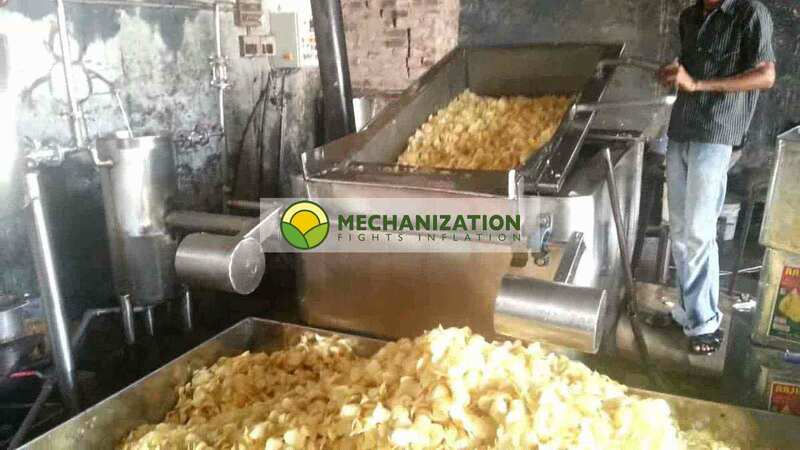 Second hand potato crisp processing line with a capacity of 250 kg/hr for sale. The line has been sold. A list of the equipment, which will give you a good idea what is necessary for the production of crisps. Slicer (copy of Urschell) Original knife-sets of Urschell are used. The part of the line where the fresh potatoes are prepared to enter this (heat) part of the line is not shown here. Before the potatoes enter in this final part of a crisp production line they must be: washed, peeled, sliced, graded and dried. This process is similar to the preparation for the production of chips (French fries). A very simple version of this part you can see: potato preparation for the production of chips.